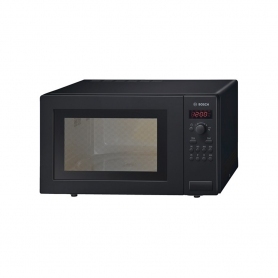 Save time cooking your family meals with this Bosch microwave oven. Whether you’re heating up leftovers or defrosting meat, this fantastic appliance will do the hard work for you. With the easy-to-use controls, you can’t go wrong with the HMT84M461B. 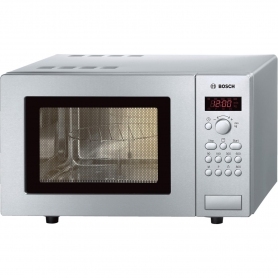 This Bosch microwave is also available in brushed steel - take a look here. The HMT84M461B has a 25 litre capacity, so you’ll have plenty of space to cook a wide range of dishes. 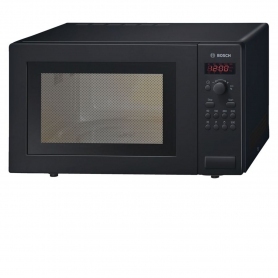 This microwave oven has a 51.3 cm width, so you’ll easily be able to find a space for it on your kitchen counter. There are five different power levels to choose from, ranging between 90 W and 900 W. Select your desired settings with ease using the electronic control. To make cooking your food even more flexible, this model comes with a range of programmes. There are three weight automatic cooking programmes, and four weight automatic defrost programmes. These will cook or defrost your food to perfection, based on the weight you enter before the programme starts. There’s even a memory function, which stores the settings of the previous cooking session. This feature is ideal if you have multiple dishes that require the same cooking time and power level. Inside the microwave there’s a 31.5 cm glass turntable, which rotates while the appliance is in use, for even cooking and heat distribution. Should there be any food spillages during use, this can easily be wiped clean. With the help of the large digital LED display, you can easily keep track of your cooking progress. The 99 minute timer lets you know at a glance how much time is left, so you can prepare the rest of your meal in the meantime. 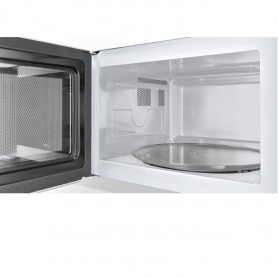 There’s also a useful interior light, so you can see everything inside the microwave whether it’s day or night. The door is side opening, giving you easy access to your food. There’s also a fuss-free handy push button, to make opening the microwave a breeze. The HMT84M461B comes in a stylish black finish. Why not add this fantastic appliance to your basket today?